Altinet’s Managed Backup for Gmail and G Suite is designed for the cloud to cloud backup of your Google accounts, including Gmail mailboxes, calendars, and contacts, as well as Google Drive Backup. G Suite and Google Apps for organisations are convenient tools for a variety of needs. The storage that organisations consume is growing constantly. Original Google cloud backup tool works as a sync service. Altinet’s Managed cloud-to-cloud backup provides real backup servicing with version control and data deletion control. To protect your critical emails, documents, sheets, and other files from being permanently deleted by accident, hacker attack, or data folders or labels to back up from G Suite services, such as Google Drive, Gmail, Google Calendar, Google Contacts, and Google Sites. Losing Data is stressful and financially challenging. Over 50% of data loss issues are the result of end-user mistakes, not to mention ransomware attacks that may infect your computer and cloud storage. 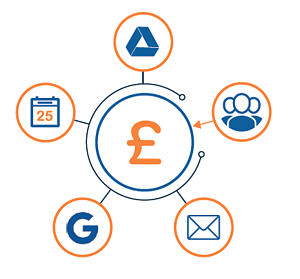 Having a backup of your G Suite and Google Apps data protects your organisation from accidental data deletion, giving you peace of mind that the restoration of data can be done with just a click of a button from a separate backup. Backup and restore entire mailboxes, calendars, and contacts. Data is protected at rest with 265-bit AES encryption and white in transit using SSL encryption. Specify the length of time each item stays in the cloud.